With a rich history dating back to many eras, Chambal has a lot to offer for everyone, be it the intimidating wildlife and exquisite landscapes, ancient forts and ruins, sacred temples and enthralling mythology or the renowned exploits. National Chambal Sanctuary, is a 5,400 sq. km located on the Chambal River is a tri-state protected area of Rajasthan, Madhya Pradesh and Uttar Pradesh in Northern India. 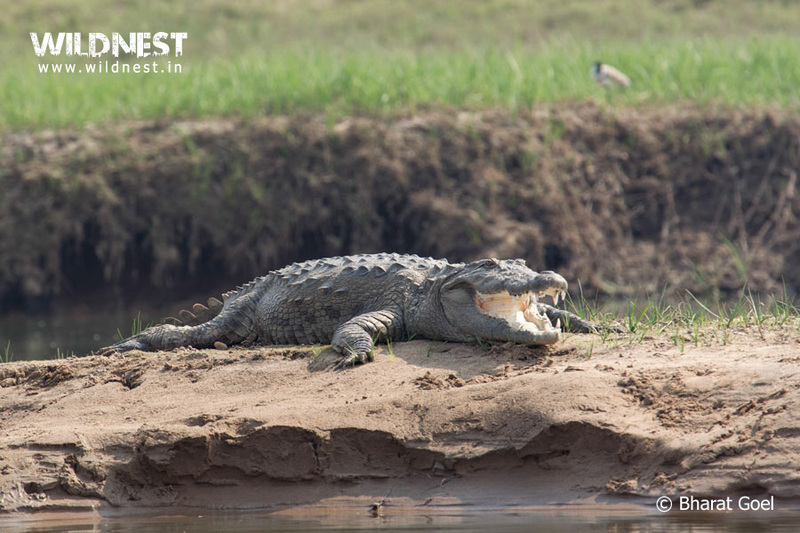 Also called the National Chambal Gharial Wildlife Sanctuary, it is home to critically endangered gharial, the red-crowned roof turtle and the Ganges river dolphin. It was first declared in Madhya Pradesh in 1978 and is now co-administered by the three states. The landscape comprises of the Chambal River crisscrossing through ravines and hills with many sandy beaches. Boat Rides available at several points along the river, offers good opportunities for the sighting of gharial, dolphins and various species of water and shore birds with a spectacular backdrop, adding to the photography experience. Walking trails along the river and ravines offer great opportunity to explore the fauna and flora of the sanctuary. The upper limit of the sanctuary starts at the Kota Barrage in Rajasthan, and extends till Panchnada, approx. 5 kms after the Chambal and the Yamuna meets at Bhareh, in Uttar Pradesh. Apart from boating, this place can be explored on foot, camels and jeeps. Extensive sand mining in the area is a big threat to the fragile ecosystem of this sanctuary. Common plants in the sanctuary include khair (Mimosa catechu/ Acacia catechu), palash(flame of the forest /Buteamonosperma), churel (Indian elm tree), ber (Indian plum/Ziziphusmauritiana) and grassy patches on both sides of the river. National Chambal Sanctuary is the main area for the species reintroduction programme of the gharial. Apart from critically endangered gharial, the red-crowned roof turtle and the Ganges river dolphin, other large threatened inhabitants of the sanctuary include smooth-coated otter, mugger crocodile, Indian wolf and striped hyena . Chambal supports 8 of the 26 rare turtle species found in India, including three-striped roof turtle, Indian narrow-headed softshell turtle, and crowned river turtle. Other reptiles that live here are: Indian tent turtle, soft shell turtle, Indian roofed turtle, Indian flapshell turtle and monitor lizard. Other Mammals include: Hanuman langur, rhesus macaque, golden jackal, common palm civet, Bengal fox, Indian small mongoose, Indian grey mongoose, wild boar, sambar, nilgai, jungle cat, blackbuck, Indian gazelle (chinkara), porcupine, northern palm squirrel, Indian flying fox, Indian hare and hedgehog. It is also an important bird area with over 320 species of resident and migratory birds reported here. The most popular is the Indian skimmer. Others include Sarus crane, Pallas’s fish eagle, Indian courser, lesser flamingos, pallid harrier, black-bellied terns, ferruginous pochard, red-crested pochard, bar-headed goose, great thick-knee, darters, greater flamingos, and brown hawk owl. Chambal Sanctuary is open from Mid-October to mid-June,as during June to October during monsoons, the river banks gets washed/inundated and water level also rises; hence it is not advisable for navigation. From October weather starts becoming pleasant and one can visit during November to March. By this time one can see migratory as well as local birds. The birds usually sighted are ruddy shelduck, bar-headed geese, Indian skinner, flamingoes, darters, open bill storks, sarus cranes, etc. Chambal is North India’s cleanest river habited by remarkable variety of fauna. Chambal is the only river in India, which has got status of a wildlife sanctuary. About 400 km of Chambal river flowing in three states namely Rajasthan, Madhya Pradesh and Uttar Pradesh passing through mud ravines extending up to 10 km on either such almost free of homo – sapiens, is full of wide varieties of birds and exotic and endangered animals such as gharials, crocodiles and fresh water dolphins. The river is also home to smooth-coated otters. In all 146 species of resident and migratory birds have been recorded. Best place to see gharials, dolphins and Indian skimmer. Dholpur is situated on NH-3 between Agra and Gwalior. Distance from some important nearby cities is as follows: Delhi-260 Km, Jaipur 300Km, Bharatpur – 100 Km, Agra-60 Km, Gwalior-60 Km, Jhansi-160 Km. Nearest railway station is in Dholpur. Some major trains from places such as Delhi, Mumbai etc. stops here. Alternately one can take a train to Agra (60 km) or Gwalior (60 km) or Bharatpur (100 km), which are well connected to all the cities throughout India. Nearest Airport is in Agra (60 Km) and Gwalior (60 Km) and is connected to Mumbai (position as in July 2014). New Delhi airport is 270 km away and is connected with all the cities in India.